Mathematics education has changed dramatically over the last decade. What, how, and why we teach mathematics is now very different than many adults can recall from their own experience. Yet it is essential for parents and guardians to be partners and supporters in math teaching and learning. FAMILY MATH is a program designed to reach out to families to inform them about current teaching and issues in mathematics education, and show parents the important role they can play in supporting the mathematics learning of their children. We hope the information on this page makes it possible for this wonderful family outreach opportunity to happen in your school and community! Parents play a critical role in their student’s education. If we are to work, share, and collaborate with them, we must keep a few thoughts uppermost in our minds. 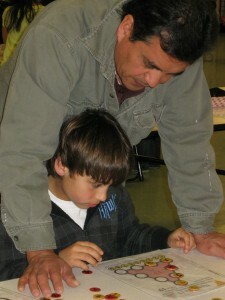 Below are three parts of an informative article on hosting a Family Math Event in your school. Each article is meant to provide thorough planning information and suggestions so that you can make Family Math happen at your school. Teachers too busy to host a Family Math event at your school? Why not let a group of math student leaders plan, develop, and host a math event for your families. This article tells in great detail how one teacher, one volunteer, and 16 willing 4th graders hosted a successful Family Math event at their school. In this part you will learn WHY your school should host a Family Math event, what the GOALS might be, and WHEN in the year are the best times to host such an event. In this part you will learn HOW you can organize, plan, advertise, and budget for a Family Math event to ensure it is well attended and successful. In this part you will learn about WHAT to do during your Family Math event, two possible Family Math models, choosing and making the activities families, setting up a schedule, and how to make the most of the opportunity to communicate with parents and guardians about the their children’s mathematics learning. It’s very important to “do math” at a Family Math Event. Don’t just talk about math, have parents actually do a math activity (or more). This article gives useful advice on how to choose hands-on activities at a Family Math event that everyone can do and will enjoy doing, but at the same time sends a powerful message about math! How to Get Parents and Families to Turn Out! You can design a wonderful math event, but you cannot count it a success unless parents and families turn out in numbers making your time and energy worthwhile. This article describes means and strategies that other schools have used to successfully boost attendance at parent and family math events. Parents send a powerful message to their children when they participate together in a positive mathematics experience at home. As a teacher, you can play a role in parents and children enjoying mathematics activities together! Here are a few tips how teachers can send mathematics home successfully. Often parents think that we only have to teach students paper and pencil mathematics skills, when in fact we teach students to use MANY different math tools. This article and activity is great for helping parents realize the value of different math tools best suited to different types of mathematics problems.